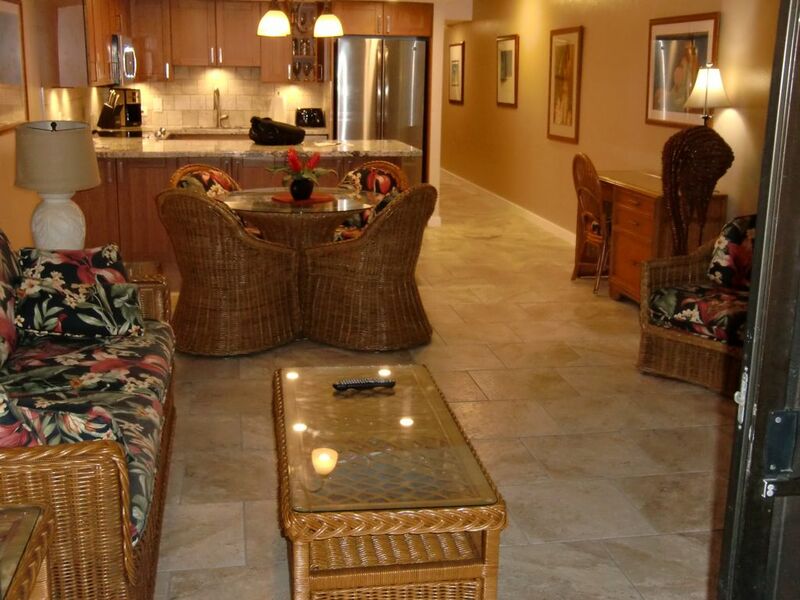 The condominium is located in Building 10, directly opposite Kamaole 3 Beach, one of the premier beaches on Maui, with swimming and snorkelling at your doorstep. You can sit on the lanai and watch the sun set into the ocean, or whale watch November through March. The complex surrounds a central landscaped area that contains fountains, a large swimming pool, 2 hot tubs, pool-side exercise room, activity centre and tennis courts. You are within walking distance to shopping and fine dining, and a short distance to the Wailea golf courses and Shops of Wailea. This unit has a very well stocked full kitchen, or you may choose to cook at one of the eight double gas barbecue centres on the property. The condominium is fully self-contained, and has been totally renovated. It is an excellent location for a family vacation or a romantic getaway. The condominium is decorated to give a relaxed home feel. It is not a sterile hotel atmosphere. It is fully equipped with all that you will require in the kitchen. The large lanai (12 feet x 12 feet) actually feels like an additional room, where you can spend time enjoying your meals, relaxing, reading or enjoying the variety of birds - aka 'freeloaders'. renovated kitchen, all updated appliances, fully equipped ( you will not run out of plates, glasses etc. there is Kayak/canoe rental from the boat launch 5 minute walk from condo. there is whale watching and snorkel tours from Maalea Harbor or from the boat launch 5 minute walk from the condo. There are numerous golf courses within 30 minute drive.